Rita Ackermann (b. 1968, Budapest) is a Hungarian-American painter renowned for subject matter that challenges and liberates traditional depictions of the female body and archetypes in figurative painting. Ackermann draws inspirations from literature, film, and philosophy to create a diverse body of work that speaks much of her perspective and experience of a young European artist submerged in American culture. 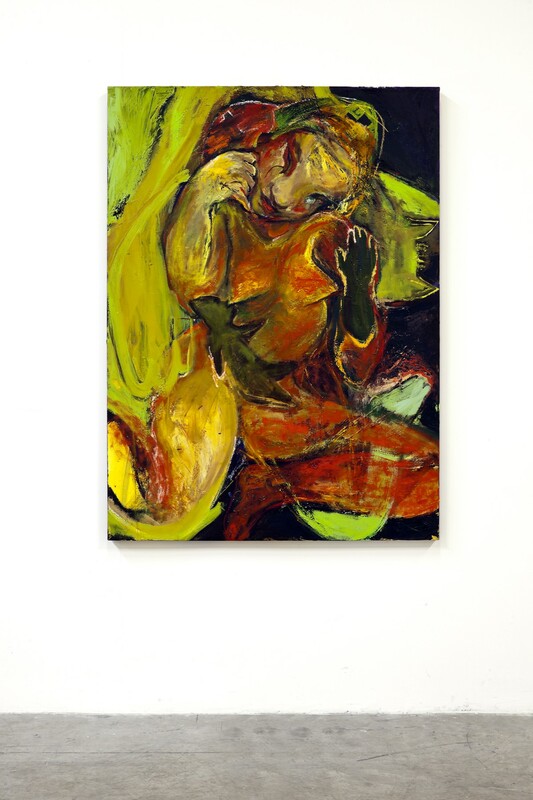 She primarily works in large-scale, ferocious multi-media abstractions, with paint smeared, sprayed, stained, splattered alongside and over sexualized depictions of cat-eyed, feral pubescent figures, a recurring image in her paintings. Illustrative and on first glance forcefully careless, her paintings create a messy and unstable fray of energetic, convulsing feminine iconography. African Nurse debuted at Ackermann’s solo exhibition, “Don’t Give Me Salad (Nurses)” at her representative gallery, Andrea Rosen in New York in 2008. The show read as a reference to Richard Prince’s over-hyped series “Nurses” and introduced an army of womanly subjects that both challenged Prince’s overtly seductive and fetishized representation of the female nurse and overturned traditional perceptions of the nature and function of the woman, as both professional caregiver and mother figure. In African Nurse, the figure simultaneously occupies a duality of nurse representations and female tropes: otherworldly and one with nature, provocative child bearer and delicate nymph. In her bareness lies a seductive quality; yet her wide-set eyes and fleshy neon yellow skin create a deformed alien-like appearance that is mythical, vulgar and grotesque. Her limbs seem to embody a plant-like appearance that suggests a personification of Mother Nature, while her slumped body caressing an ambiguous object alludes to her function as a nurturer. For many of her paintings, including African Nurse, Ackermann’s technique and approach to painting would involve her sprawled across an unstretched canvas on the floor, using her hands to drip and scratch paint. Her use of gestural force with the material allows for stylistic uninhibitedness in her pursuit of a narrative and figurative depiction that collides with affective charge and frenzied abstraction. African Nurse was included in “Rita Ackermann,” a major survey exhibition on the artist’s life and work at MOCA North Miami (March 15 – May 6, 2012). Ackermann has exhibited internationally at major institutions including the New Museum, New York; the Museum of Modern Art, New York; Kunsthalle Wien, Vienna; Centre Georges Pompidou, Paris; Kunsthalle Zurich; Zurich; Whitney Museum of Art, New York; and Museum Ludwig, Cologne; among others. Ackermann currently lives and works in New York.